Clarinetist Eileen Walsh has held the position of Second Clarinet and Bass Clarinet with Symphony Nova Scotia since October 2007. 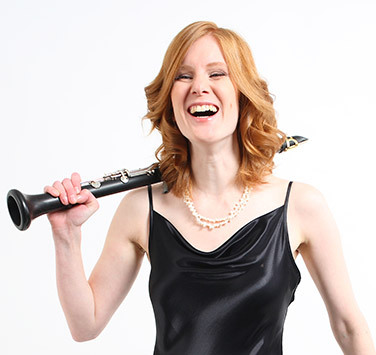 Formerly the Associate Principal and E-flat Clarinet with the South Bend Symphony, Eileen earned her Master of Music degree and Performer Diploma from Indiana University in the studio of Eli Eban, and her Bachelor’s degree at the University of British Columbia in the studio of Wesley Foster. Eileen’s love of chamber music has led to the co-founding of the Fifth Wind Woodwind quintet and the Jollimore Trio, and most recently to her joining Rhapsody Quintet. Eileen is currently on faculty at Dalhousie and Acadia Universities, and she lives in Halifax with her husband, flutist Jack Chen, and their two young boys. Other pursuits include performing on period instruments, and a two-year term as Associate Instructor of Music Theory at the Indiana University Jacobs School of Music. Dark chocolate. I spent $30 on chocolate bars at Pete’s Frootique once! Granted, one of them cost $10. It was worth every penny! [BESIDES my husband!] My grandmother (“Oma,” in German). She can find another use for anything you might throw away, and she mailed me dried herbs and lavender in some tissue paper in an envelope this week! I learned how to survive from her. Not to mention how to make every German dessert I can think of! I love to cook, especially for company. It’s good to fret about something different for a change! I love to get outdoors and forget the civilized world for a moment. There is so much natural beauty in Nova Scotia!